Since the launch of Heli-Shuttle™ we have successfully transported a numerous amount of helicopters across Europe. Heli-Shuttle™ has a custom made low bed trailer, extendable to 14 meters with a unique self loading and un loading ability that requires no expensive lifting equipment, coupled with the capability to load small, medium and large range helicopters on wheels or skids. 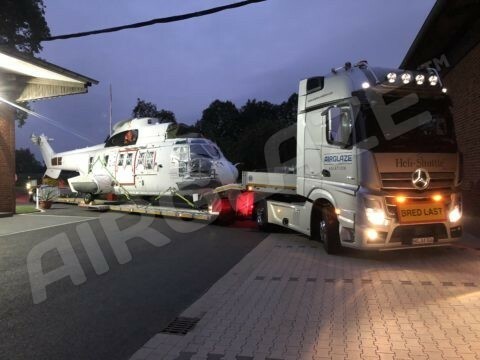 Whether you are looking to move your helicopter to and from your MRO/OEM or you simply want to transport it to another location, Airglaze-Aviation™ will safely and efficiently provide a solution to suit your needs. Please visit our gallery for images on various transports. 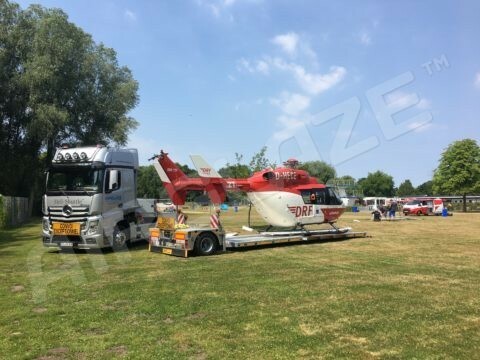 Transport your helicopter without the need of dismantling.